Cheek and Chin Protection and Good Visibility. Service center is in the U.S.
Free Shipping upgrade. Items ship Express with standard shipping cost. Handmade in Thailand with Durable Leather Construction. Comes with Fairtes MG - Mouthguard (OEM), in light green or light blue color. 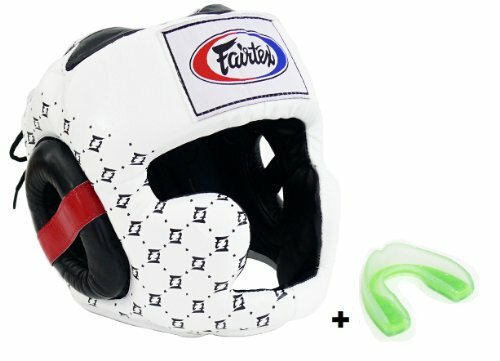 This is the next evolution of Fairtex most popular Headgear. It offers a great balance between coverage, visibility, and weight. This new version features increased padding, while not sacrificing any of the lightweight design that has kept our Headgear so popular. Truly one of the best Headgear available anywhere.